You’ll have to bear with me here, as I’m about to explain a concept which is mildly complicated and will, once grasped, prove of absolutely no use to you for the remainder of your life. It is something I would call “aggregate vintage”. Let’s say you drink two wines one evening. One is from 2007, and the other from 2009. It is currently 2012, so one wine is five years old, and the other three years old. Combine them and you have eight years of wine age, giving your evening’s drinking an aggregate vintage of 2004. Perhaps, for the sake of argument, you might try a few mature Bordeaux over an night, say one from 1982, one from 1983 and one from 1991. So one is 30 years old, one 29 and one 21, making for a total age of 80 and giving an aggregate vintage of 1942. That’s the idea. See, it wasn’t so complicated. 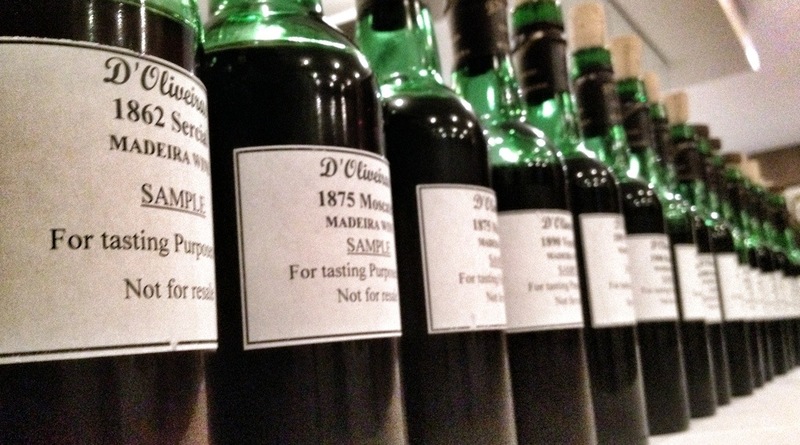 One night, just before my Olympic lockdown, I spent a few hours tasting wines from Madeira. You can see some of the bottles I tried that night above – you’ll notice that the one nearest the camera dates from 1862, the year after Charles Dickens wrote Great Expectations and the year before Abraham Lincoln delivered the Gettysburg Address. It was not the oldest wine there. I tried a total of 40 wines, of which 32 had a stated age or vintage. Some of them were pretty young: a 2001, a couple of 2000s, a handful from the 1990s. Others were very old, the oldest dating from 1850. Add up their ages, subtract from 2012 and you get the aggregate vintage: 320BC, closer to a time when woolly mammoths roamed the earth than it is to now. Of course 40 wines is quite a lot, particularly when they’re pretty alcoholic. Towards the end, despite liberal use of a spittoon, my tasting notes became a little imprecise: “As above but with more toffee”, for example, or “very fecking good. Feeling a bit emotional”. So it was that the main thing I learned that night was respect for proper professional wine tasters. All of these wines, and several more besides, had been sent to Neal Martin, newly-appointed Iberian supremo at the Wine Advocate, for adjudication. He had a little sup of each and decided that it would be a bit sad to tip the rest of them down the drain, so convened a small gathering of interested others to do them a bit more justice. He tasted all of those wines over a single afternoon and produced for each one of them a tasting note that makes sense, and a score that will be used to decide their market valuation. I could not do his job. I was one of the early arrivals, and after standing about for a while waiting for the Madeira experts to arrive we decided that with so many wines to try and time passing pretty relentlessly, as it does, we might as well get cracking. So we poured ourselves a couple of little tasters: a 1996 Barbeito colheita, and an 1850 d’Oliveiras verdelho. I thought it was a brilliantly illuminating comparison, between a dense, sticky, intense old wine (above, left) and its younger, brighter, nutty younger relative (right) (I preferred the 1996). 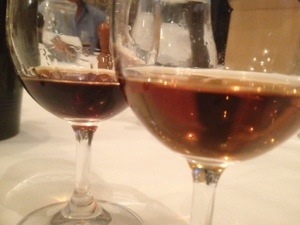 When the Madeira experts arrived, they were inevitably horrified at our choices. As Madeira is left to age in oak casks the water gradually evaporates, leaving an ever more intense liquid to be eventually bottled. After a century and a half this liquid is pretty damn intense; tasting it first did little to aid our ability to taste what followed. But I’m not an expert, and would happily have taken half a dozen contrasting pairs over 40 individual wines and learned a lot more from the process (though the aggregate vintage would have been less impressive). For me, the great pleasure of really old wine is not the taste it offers (subject to certain minimum standards being met) but the thoughts it provokes. To hold in your mouth the juice of grapes which grew 150 years ago and more, to think about the time that has passed since, and the people who have lived and died, is quite humbling. At the end of the evening I took home a couple of not-quite-empty bottles, one from 1875, so I could give them the time and respect their great age demanded. It is an experience I will not quickly forget or, at about £750 a bottle, repeat.